Now, for Monday the 14th. SPX hits a turning point high and drops through the opening on the 18th. The Dow appears to open Monday lower, and hits a panic cycle. It gets a bit hairy in this area, but the following turning point is the 16th, which I have to guess is a low (continued from the drop on the 15th). Perhaps this panic cycle isn't a reversal, but just a capitulation, which he says can happen when he defines panic cycle. That makes more sense. The weekly is hard to interpret, saying this week is not a turning point, but next week is, along with a directional change. Although after this week, we get a nice purple bar, a continuation of whatever we end the week with. Note - the original post isn't very accurate in terms of up/down days, but it's mostly good on the turning points, other than the election. Literally nothing can stump the Trump. Also the Comey announcement sent the markets crazy. This should be the most viewed post I've done so far! Anyway with today (currently) finishing down, then it looks like we have one more down day. This is still low confidence. The next high confidence play is to take the opposite of Monday's action. My goal is to figure out how these are both right. I have them staggered a bit to line up the days. They came out on different days. One mistake can switch everything downstream, and the odds of me nailing all this perfectly are nearly zero. Most of the discrepancies occur around panic cycles. 11/7: Monday: A turning point on both systems. I suspect this is a continuation of today, so an Up day. If it is a down day, then it just makes the downstream predictions flip. This is a low confidence prediction day. There will be a high probably near the close. Of note, Bo Polny things this day will be an epic collapse day (but he's had a few of these) Armstong mentioned they might push the market down to scare people away from Trump. Hmm, didn't work in 2008. Market slide favors change I think. Up protects Hillary. 11/9: A VERY low confidence day, but I'm thinking down. If we finish this day strong and with a buy signal then I'll be a little bit long. Otherwise nothing. Mannarino recommends buying options 60-120 days out, but in the last 3 months I have been doing this, I have never held a position loner than about 4 days. Particularly in this choppy market holding longer term seems excessively risky. 1) Does it really make sense to buy that far out with the additional costs that entails? 2) How far out do you guys buy, and is it different for the overnite v. other trades? Thanks for your input! I don't think I'd buy that far out. more like 1 month for me. peter schiff said the largest loosing streak ever was on 1966, 12 days. 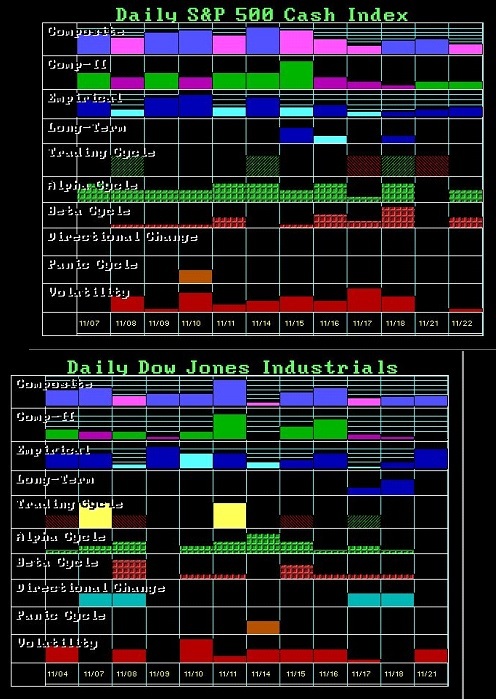 Weekly Timing Array for the Dow. Is it possible Chelsea is not evil? YES, thank you, who's ready to make some money?